After stripping out all of the unnecessary wiring when we competed in the BRSCC Mazda championship, I hadn’t anticipated a day when we’d need to reinstall headlights and indicators again! 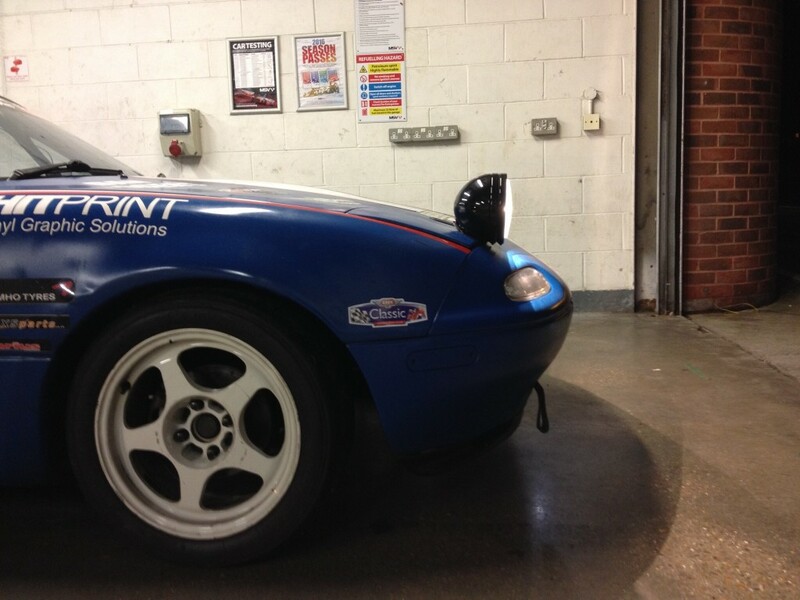 The Classic Sports Car Club (CSCC) night race at Brands Hatch was a race I’d looked forward to all year. Preparing the car for this sort of event took a fair bit of research to balance cost with a lighting setup that would be reliable and effective. 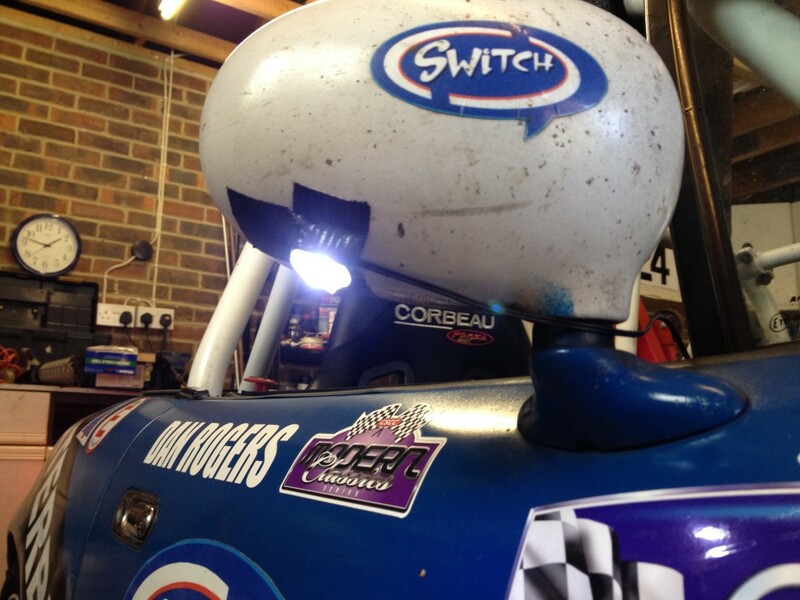 Compared to a few years ago, the choice of race car lighting is enormous including LED, xenon and halogen options. The prices can range from £40 to over £1000 and you also need to factor in additional wiring, relays and switches. From a regulations perspective the MSA requirement for the night race at Brands Hatch was for cars to have a maximum of 4 forward facing lights which must be fitted in pairs. There must also be illumination of the side numbers, and these must also be reflective. The rear of the car must have tail lights, and brake lights. Direction indicators are also needed for the front and rear, however side indicators were not needed. 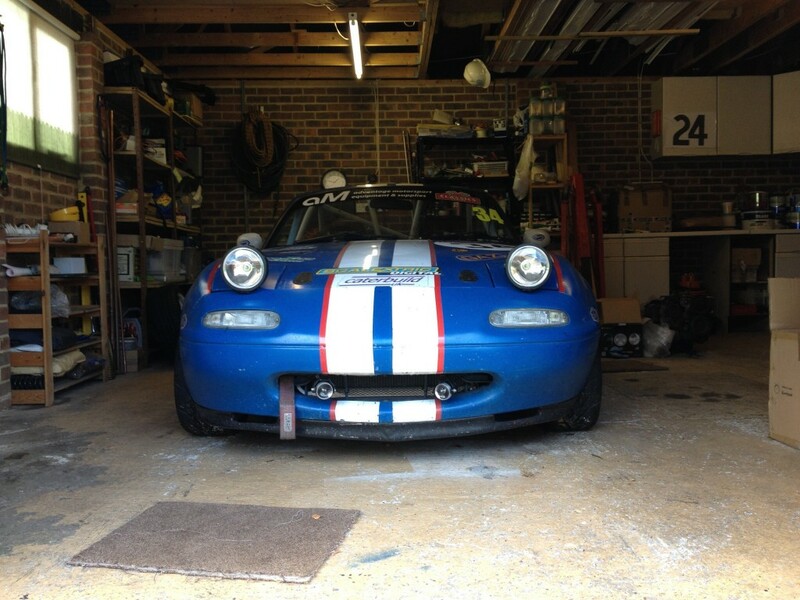 My MX-5 was a road car at one point which made things easier but the pop-up headlights are a heavy addition to the car and sourcing these was an additional cost I didn’t really want. The standard headlights are also unlikely to give me the concentrated light which I require, angled higher than the traditional road headlights. Floodlights or spotlights? This was one of the trickiest decisions. Getting the balance right between throwing light forwards and throwing light sideways. When racing and reaching speeds of over 100 mph you’re looking a long way ahead and need a really clear view of the road ahead. My goal was to have two spotlights positioned in the original manufacturer position, and then fit two additional spotlights that would cross – angled towards the corner apex. 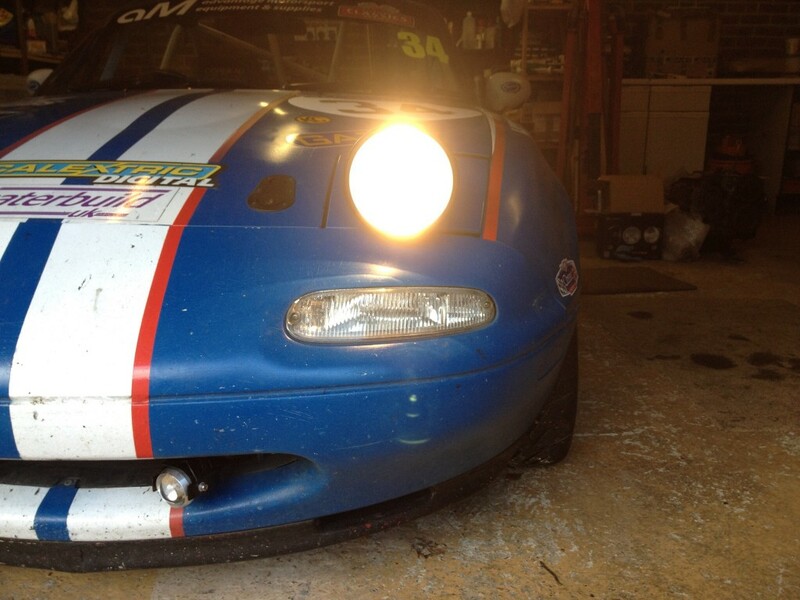 Mounted in a similar position to the standard Mazda OEM headlights, I purchased two high powered halogen spotlights. The aim was for these to be the main light sources on the car, throwing light much further forward than a standard road car setup ever would. The exact model were KC Hilites Daylighters 130W Lamps, purchased from Demon Tweeks for approx. £170. The lamps include a wiring loom which was a big positive for me as it saved a lot of time. 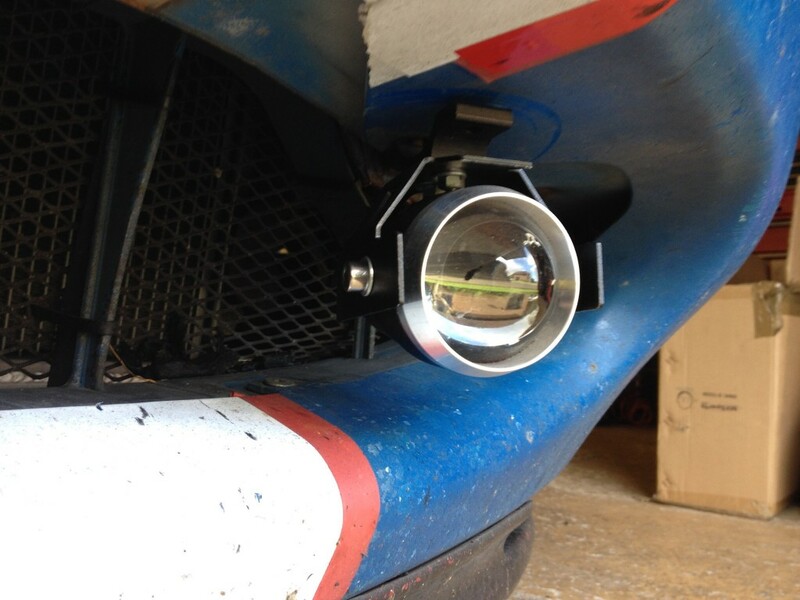 I mounted them directly to the front cross member, and cut a slot in the pop-up headlights cover to accommodate the base of the lamp. 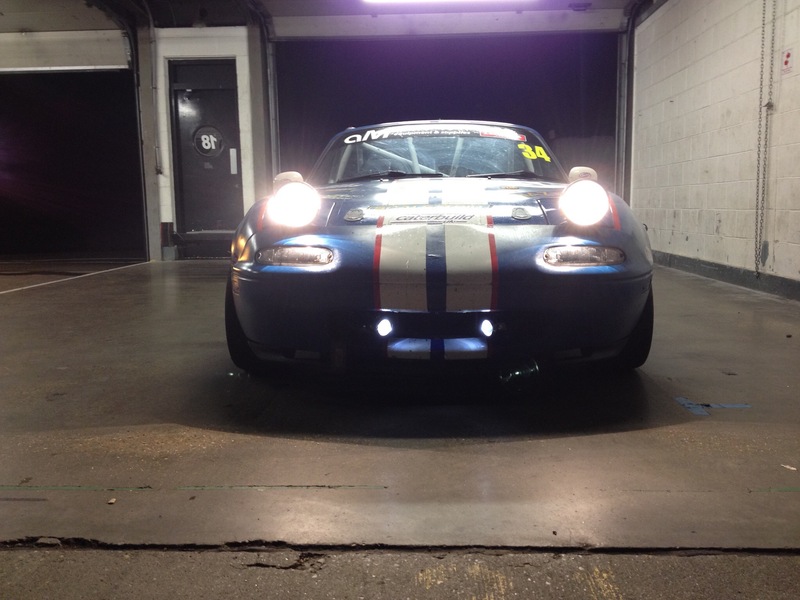 The standard MX5 indicators were then wired up again, and fitted with Twenty20 LED bulbs and run from an LED relay from AutoBulbsDirect. These were the lights which I spent longest selecting as I was torn between using spotlights or a wider angled beam. I didn’t need anything near as powerful as the halogen spotlights I was using for headlights, these were just for lighting up the apex. I liked the idea of using an LED option to reduce the strain on the battery with all the lights running – we have to restart the engine during the pit stop and so I didn’t want too much drain. I came across the CREE U5 LED spotlights which at £15.99 seemed very good value. They were slim enough to mount in the front grill which was a positive and claimed to offer a high light output of 125w from just 15w of actual power. There’s a few videos of these on YouTube as they are a popular addition for motorbike riders and for the price I felt it was worth a gamble. One thing to be aware of is the different functions which can be triggered by switching the units off then on again. This cycles the light between full power, low power, and flashing. The third mode, flashing, is a bit dodgy for track use and something you need to be aware of if the lights will be switched off then on again regularly during your race. In my case this was never an issue however. The lights mounted to the bumper support points and could easily be angled. I crossed the lights so that they could throw more light onto each respective apex. Light output was pretty impressive but not enough to use as a sole driving light because it was extremely concentrated. I would say that it’s perfect for this type of purpose as a support, apex light. In daylight this setup looks like a bit untidy, but it certainly served it’s one race purpose. 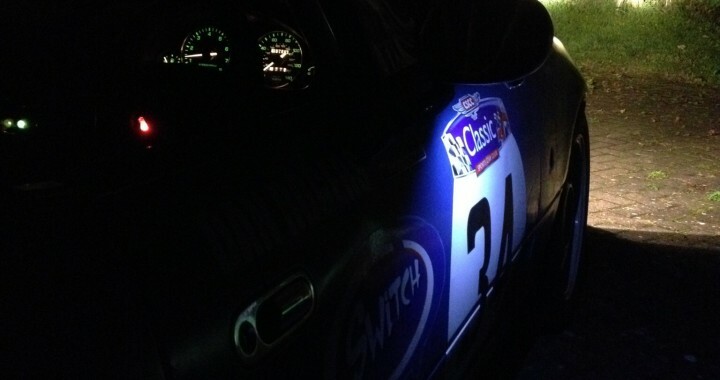 Illuminating the race numbers on the doors can be expensive when you look at the cost of backlighting panels. Fortunately the regulations at the event allowed us to shine a light onto the race number, and so a simple solution could be implemented. 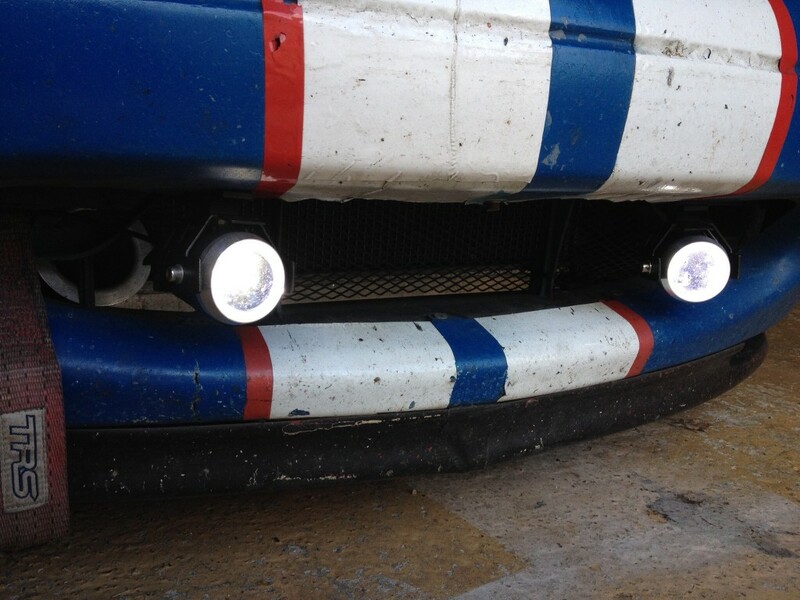 I sourced these LED puddle lights from Halfords for about £10. 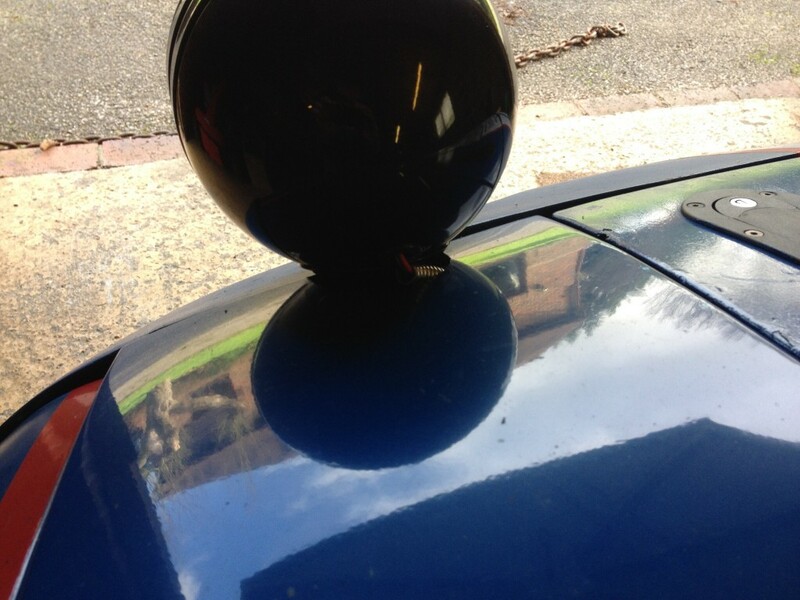 They’re an aftermarket accessory which is perfect for what we needed, and it was easy to position and stick into place. This is by far the most time consuming part for me, but maybe that’s just my lack of skills! The crucial part of the wiring, without going into all the details is that the lighting must isolate on the battery master kill switch. 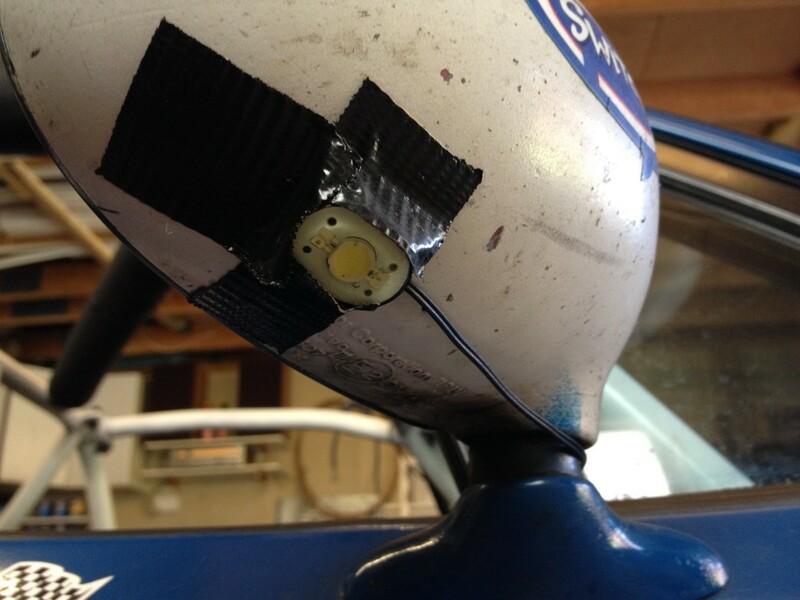 Therefore, do not wire the lights directly off the battery terminal. I took a source from the other side of the master switch in order to power the halogen spotlight circuit, and my new indicator loom. Both of these circuits and their switchers were independently fused. The LED apex lights, and number lights ran off the sidelight circuit as there was enough capacity left on this due to me running low wattage LED tailights in the rear clusters instead of usual 21w halogen bulbs. 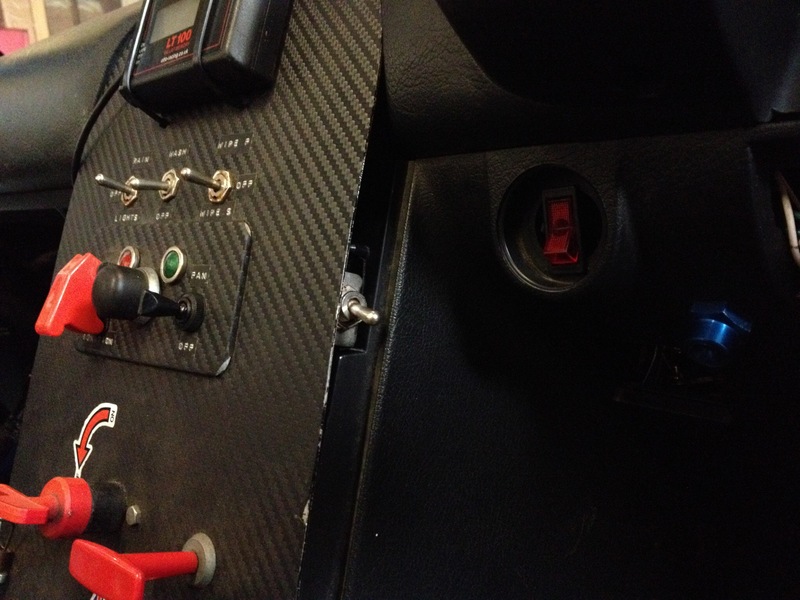 The indicators were wired to a 3 position toggle switch as it was too much work to re-fit an indicator stalk for one race again. The spotlights were also switched independently of the sidelight circuit as we may not want to run a pair 130w spotlights all the time around the paddock! Once wired up, it’s then a case of testing out the position of the lights. We’re lucky to have quite a lot of space where we keep the car and a quiet road. 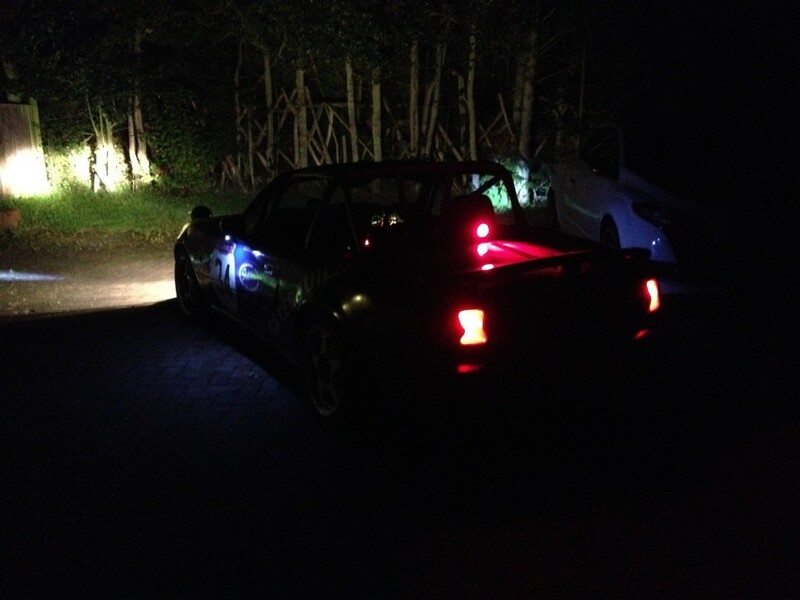 By positioning the car alongside my road car we were able to get a good idea of how the lights would perform. The amount of light being thrown out was impressive so I was confident that what I’d purchased would be up to the job. At 130w each the setup for the halogen lights draws a lot from the battery and so we wanted to try a few restarts on the car too. Leaving the lights running off the battery for 5 mins didn’t cause any issues with firing up the engine. This was good news as not being able to restart the car during the pit stop would be a disaster. Arriving at the track on Friday night was a final opportunity to check things over. The race schedule allowed us a 20 minute practice session to familiarise ourselves with the track at night. This was so valuable as I’d drastically overestimated how much the apex lights needed to be angled. They were pointing about 60 degrees inwards and we had to adjust these several times until they were right. In the end they were about 20 degrees (almost straight ahead compared to my original guess in the photos below). This gave a good balance for lighting at Brands but if we went to another track with different corners we’d need to refine this again. This lighting setup worked really well, and at £200 all in, it has to be one of the best value starter setups available. If I were to do this all again i’d look at obtaining apex lights which have a slightly wider spread as there were occasions when they were a bit too concentrated. One other thing we learnt was how similar cars look at night! I’d recommend adding some distinctive lighting elements to the car. The LED light strips you can buy nowadays serve this purpose very well at a reasonable cost. 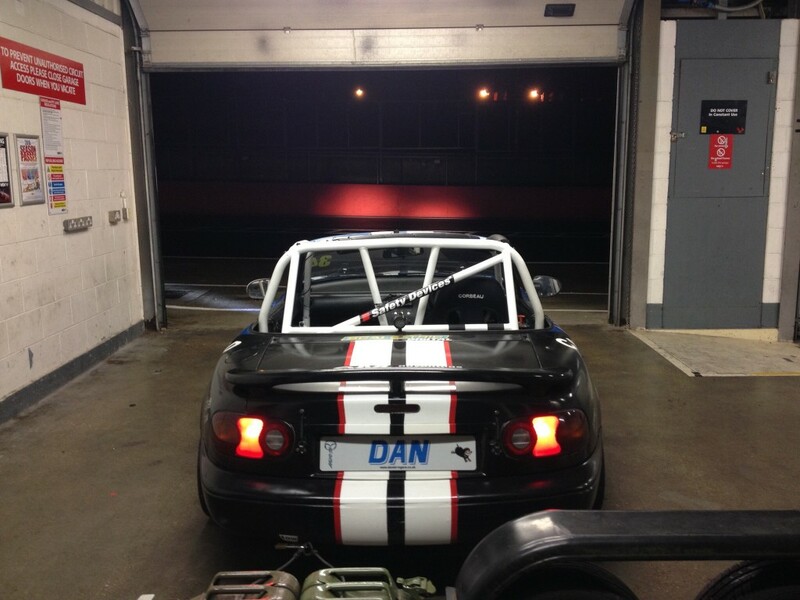 Wrapping part of the roll cage in subtle light colour will help to pick out the car amongst all the others. Want to know how we got on at Brands Hatch? Check out the race report here. Sorry, no related articles could be found.